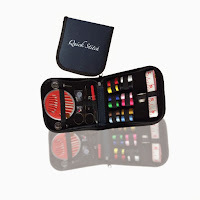 The Quick Stitch Sewing Kit is contained within a black, zippered fold-over with, "Quick Stitch" on the Front and it's the most complete sewing kit that I've ever come upon. The measuring tape is 60 inches long. There are 12 differently colored thread spools. But, the thread is extremely thin, as are most thread spools that you will find in any sewing kit. The covered seam ripper is aptly sharp as are the tiny scissors. Three buttons and two ball-headed straight pins are enclosed in a small plastic pouch and these are a real bonus! I can never find such a pin when I need one. Also included is a small safety pin, two threaders and a container of differently sized needles. This is also a bonus. When you need a sewing kit, you might need it to repair something thicker than a blouse. The Quick Stitch Sewing Kit lists for $24.95. But, it sells for $11.95. It's a good deal for your buck.